And the healthy eats continue! Seriously though, how are you guys feeling about all the healthy recipes we’ve been discussing this January? Are you into them? Personally, I’m kind of loving them. All the colorful veggies are incredibly fun to photograph and the recipes are so my kind of recipes! Did I ever tell you that I once had a serious addiction to spaghetti squash? Like it was so serious that for a little while I think it was all I ate for dinner. Eventually my skin started turning yellow and then that freaked me out and I quit cold turkey. It was a weird, weird, couple of weeks, but I just remember mom and I having a long moment with spaghetti squash back when I was in middle school. But man, I do really LOVE it. Now that I make all these other kinds food, I’ve kind of forgotten about simple spaghetti squash. Anyway, even though it’s “healthy January” here on the blog, that still means pasta and cheese…for me at least! Yes, I consider both to be healthish foods. Don’t judge. Okay, but the squash, I guess that technically it’s not pasta. And I guess the sauce is actually vegan, but I swear, you’d think it was all cheese and cream! All you have to do is roast the spaghetti squash, add all the ingredients for the sauce to a blender, blend and then pour the sauce over the hot spaghetti squash… DONE. As you can see, I also added a poached egg to my bowl for a little protein, because I really just love a good egg. I then topped the dish off with my new favorite condiment, vegan parmesan and called it good to go. FYI, this bowl right here, it’s a million times better than the spaghetti squash I was eating in middle school…I think that back then we used spray butter. Eeew. That totally grosses me out now. The creamy sauce is a base of coconut milk and cashews. This combo together is beyond awesome and the flavors are not overpowering. Even if you’re not a fan of coconut, I would still highly recommend giving the recipe a try. I can’t say that this recipe tastes full on like a traditional Italian Alfredo, but that’s OK. This is something slightly different, but yet it still gives you that feel. You know? There’s creaminess, heartiness and all around awesome flavors going on here. If you’re not vegan, you can use parmesan in the sauce instead of nutritional yeast. Obviously you can really load up on the parmesan topping too! Like I said though, I’m actually really loving the vegan parmesan. I love the nuttiness the pine nuts give it. It’s just a little different…but I can’t lie. I also added a dusting of real parmesan too. And looking at that egg in these photos makes me think that some burrata cheese would be kind of amazing on this too. I mean, it totally wouldn’t be vegan then, but man, it would be GOOD. Next time I’ll try adding burrata for sure! Even without the burrata, the egg, plus maybe a little of the vegan AND the regular parm… oh yeah, SO good! Yup, I sure do like my cheese!! But hey, the spaghetti squash and the sauce are oh so healthy, so laying on the cheese is perfectly justifiable. Lastly, let me tell you a little bit about that egg. Oh that egg. Yes, you totally do not need it… but yes, it’s totally perfect (I love a good runny egg). 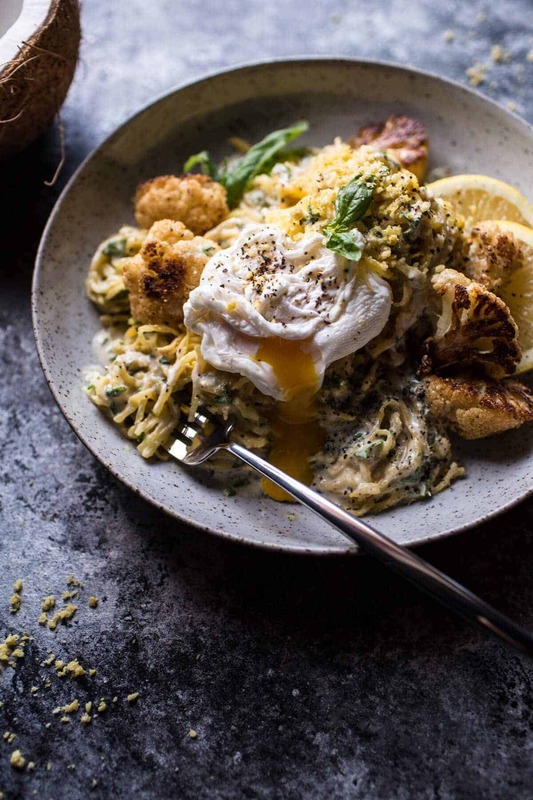 An egg + this creamy sauce + spaghetti squash = heaven. Almost like a carbonara pasta. 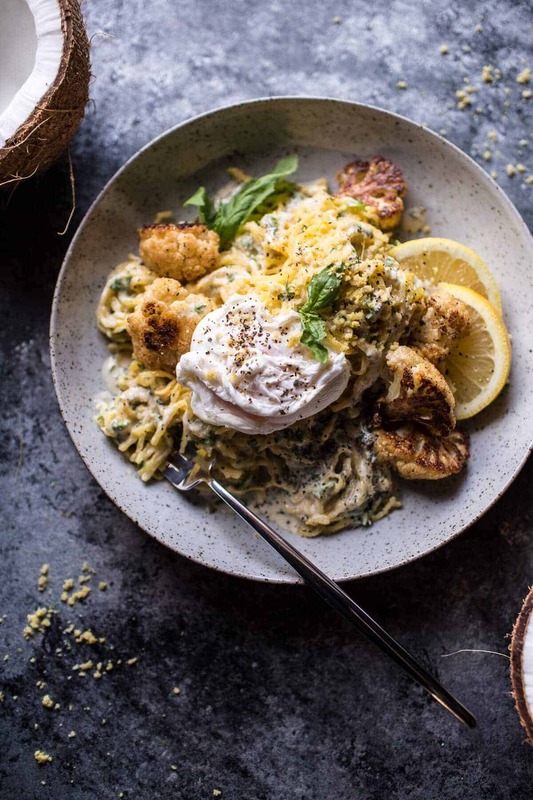 Creamy Coconut Cashew Spaghetti Squash "Alfredo". 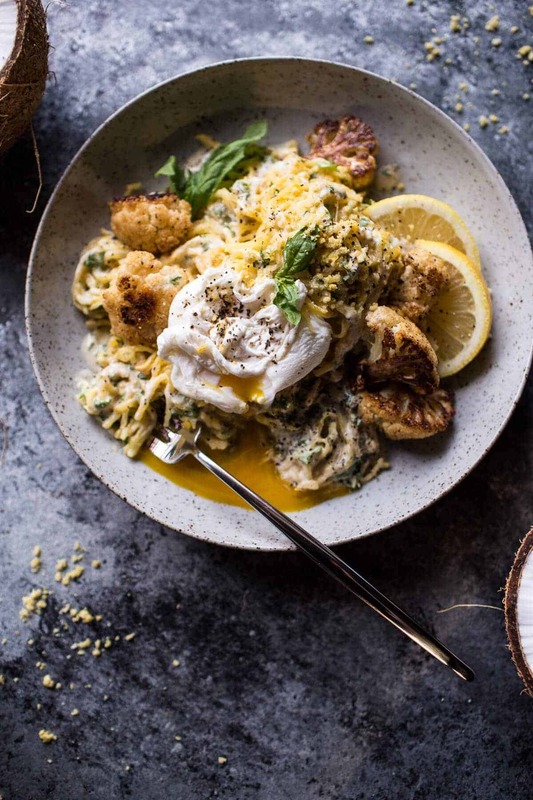 Slice the spaghetti squash lengthwise and drizzle 1 tablespoon of oil all over the cut sides of the squash halves and sprinkle with salt and pepper. Place cut side up on a baking sheet and bake about 30 to 45 minutes, or until the squash is just tender enough to scrape into strands. 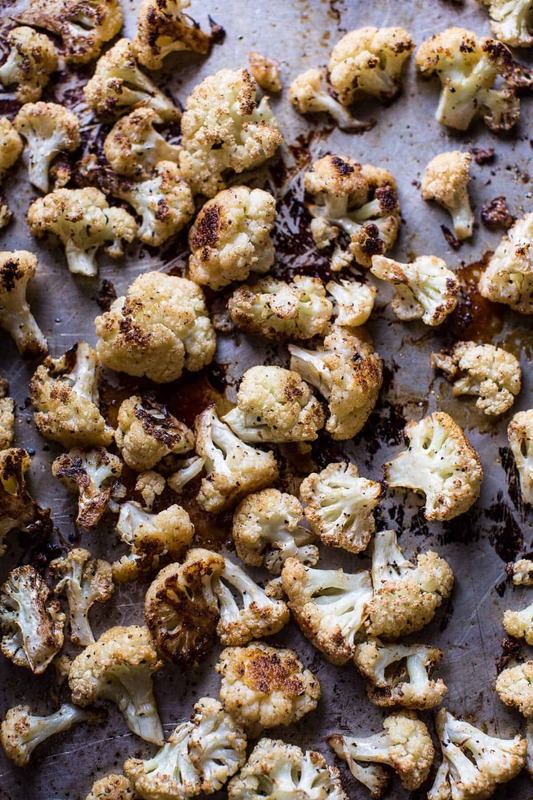 Add the cauliflower florets to another roasting pan or cookie sheet. Toss with the remaining 1 tablespoon olive oil, chili powder, salt and pepper. Roast for 25-30 minutes or until lightly charred and golden. Meanwhile, make the coconut fettuccine sauce. In a high powdered blender or food processor, combine the coconut milk, cashews. lemon juice, nutritional yeast, garlic, salt and pepper. Process until the sauce is completely smooth and creamy. Stir in the crushed red pepper, basil + parsley. Taste and adjust the seasonings to your liking. Remove both the squash and cauliflower from the oven. Scrape the squash into strands and toss with the coconut sauce. 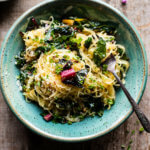 Serve warm with [vegan | https://www.halfbakedharvest.com/the-mean-green-detox-salad/] or regular parmesan, fresh herbs, crushed red pepper and an egg (DO IT). EAT! 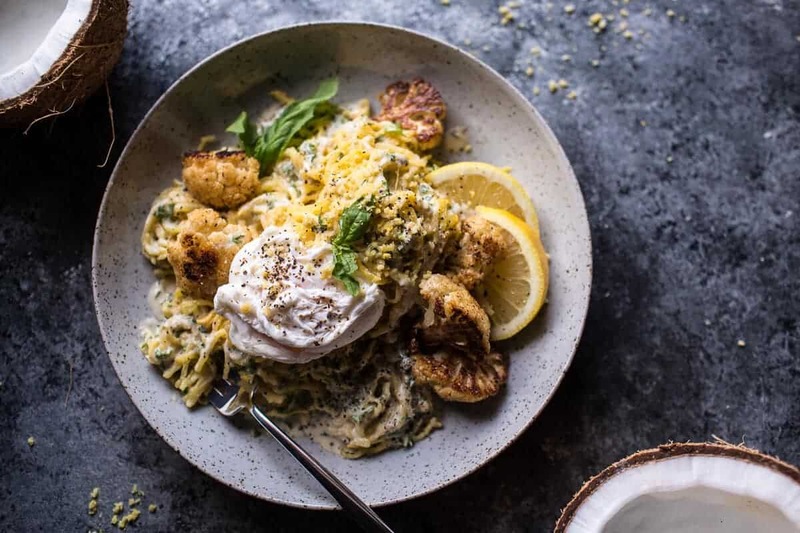 Spaghetti Squash “Alfredo”… and now we eat and eat and eat. Well, OK then! i tried making a healthy creamy sauce before, but it was mostly cauliflower and soy milk, and it ended up tasting like, well, milk and cauliflower. excited to try this one- coconut milk and cashews make things so rich-tasting! Do you have any nutritional information or calorie counts for any of these healthy dishes ? Hi Sarah, I am sorry I do not count the calories on my recipes for personal reasons. They can be calculated online. Thanks! I have no idea what a spaghetti squash might be… loving the roasted cauliflower, though!! Total gorgeousness, Girl! I feel like this has my name written on it! I always make a fake alfredo with avocado, but I love this idea! Have never tried spaghetti squash but I feel like I really should.. This is amazing. I bought both Spa Squash and caulifower yesterday..and had no idea this was going to be how I served them today. Thank you so excited. This looks so good and that egg yolk! 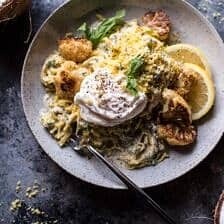 Spaghetti squash is almost impossible to get hold of here – but I love roasted cauliflower, so I may have to try and replicate that part of the recipe at least. I’m implementing a meat-free dinner once a week now and more fish! All of these recipes have been really inspiring. If this is healthy eating, count me in! It looks delicious! Your blog is brilliant. Thank you. I love that every morning i wake up to something new from Half Baked. The photography and staging is beautiful. I having been wanting to eat more green and bean but was having a tough time getting past smoothies and pea soup. Thanks for showing what is possible. Keep it coming girl. This is so creative Tieghan!! I love that sauce…totally trying this! 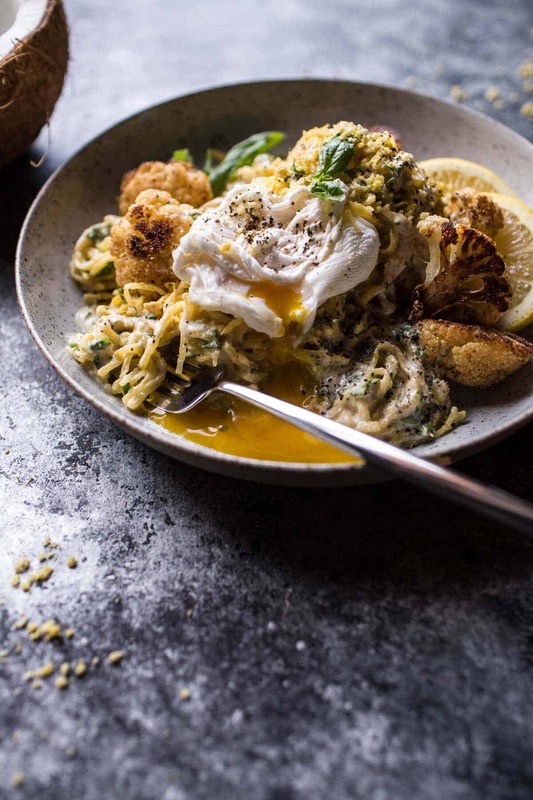 I don’t know which I like better: the spaghetti squash, nutritional yeast, roasted cashews or amazingly perfect poached egg — I love it all!! 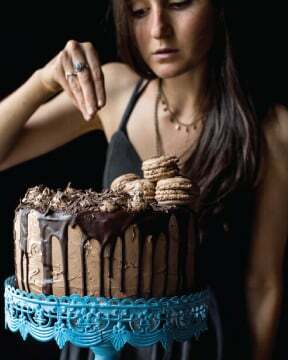 Pinning and making this later this weekend! Thanks Tieghan! 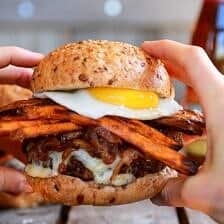 wow this looks sooo good!! I am LOVING this healthy January month! Keep them coming! This is definitely my most favorite recipe you have come up with this month. I really love vegan alfredo sauces cause not only does it makes my stomach feel GREAT but I actually like that nutty flavor that nutritional yeast makes. Love this recipe! And did your skin actually turn yellow?! This is just gorgeous. 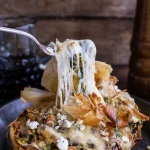 I need to try spaghetti squash, I can’t believe I never have! And that egg! So delicious, I can’t wait to try it! Do you think it would make any difference to soak the cashews? I’ve noticed a lot of cashew-based sauces call for pre-soaking, but maybe it doesn’t matter. Thanks for another amazing recipe! 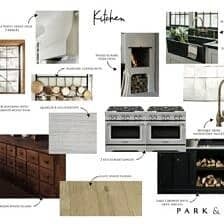 I am seriously counting down the days for your cookbook. Hahaha! I can relate to your skin turning yellow! When I was in university I was so hooked on eating lots of raw carrots that my skin turned orangey-yellow and I freaked myself out! Fake tan from the inside! This meal sounds wonderful and I will try it very soon! 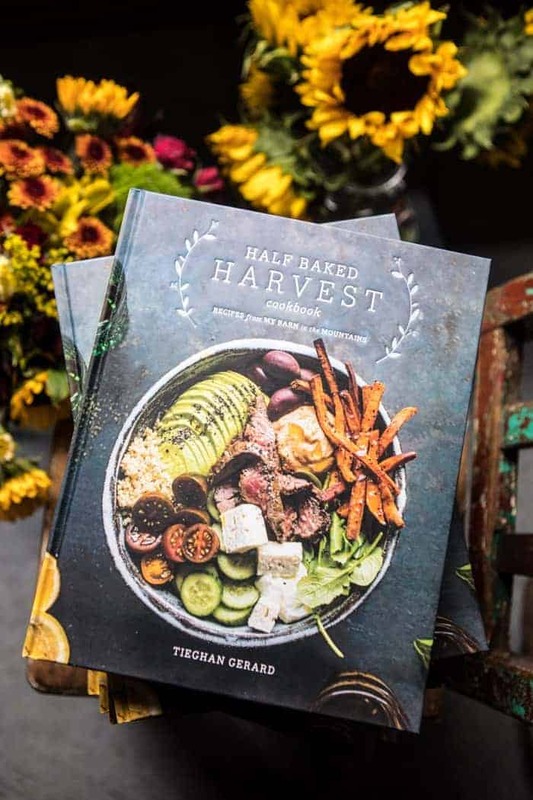 Thanks for your wonderful recipes and inspiration, Tieghan… I’ve tried out so many of your recipes and I have never been disappointed yet! I am all for healthy eats and this dinner has my name written all over it! Haha!! Yes!! So one winter I went a little sweet potato/pumpkin crazy and my feet and hands turned insanely orange. Like, call the head of the Oompa Loompas cause I found their next member, orange…. It. Was. Awesome. Haha. Oh and I vote YES to all of these healthy recipes. Seriously loving them. You inspire me so much. Love that you have made another veggie pasta dish for us! Now that’s my kind of food! Vegan, healthy, and looks super delicious too! I just got a vegetti recently and have been searching for a recipe to use it in. 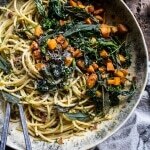 Do you think zucchini pasta would be good in place of the spaghetti squash? Thanks!! HI! Yes, I think zucchini pasta will be great! Thanks! This looks amazing , love you used cashews for the cheese sub to replicate the creaminess of this sauce. Just pure YUM!! I’m loving all the healthy recipes this month, keep ’em coming! I’m definitely not a vegetarian, but I do try to cook meat-less dinners often. I just finished eating this for dinner tonight. Delicious. Absolutely delicious. I tried your recipe. 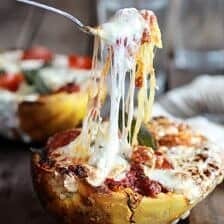 Is there an alternative for the spaghetti squash ? Ss these are hard to find. Tried a butternut but couldn’t make it into spaghetti. Even so it tasted wonderful! HI! I would make zucchini noodles or just use regular spaghetti. Let me know if you have other questions, thanks! I just made this for lunch and I literally gasped when I tried the alfredo. Hands down the best vegan alfredo sauce I’ve ever had. Thank you so much for this new staple! I love spaghetti squash. For all of u who have not tried you must! 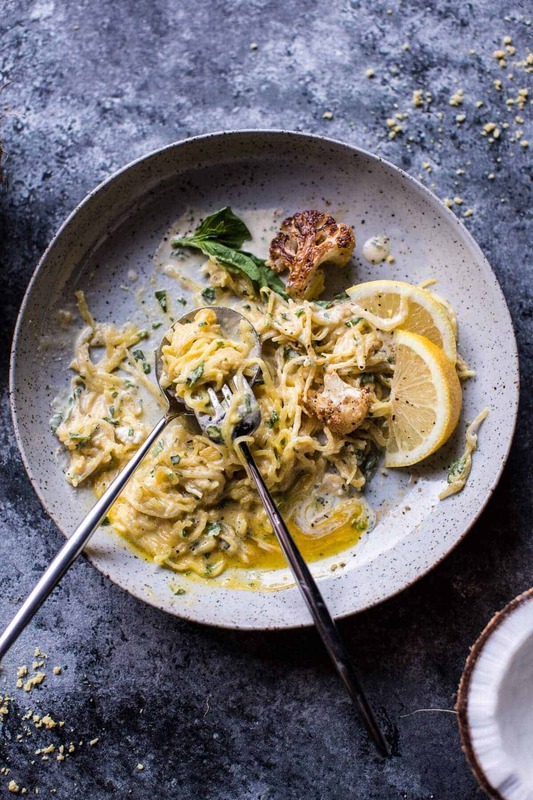 I’ve made Alfredo with cashews and cauliflower but coconut milk….mmmmm def want to try this! Maybe top it with toasted chickpeas for protein. Thank you for the beautiful and healthier dishes! Just made this for dinner last night and it was DELICIOUS!!!! Thanks for such a great recipe! 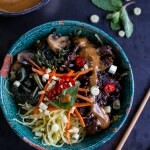 This recipe looks amazing- but I don’t have any cashews on hand– would it be too weird to use brazil nuts or hemp seeds? Or is cashew really the only popular alternative nut used for that ‘cheesy’ taste? HI! I think brazil nut will work great! Let me know if you have questions, thank you! 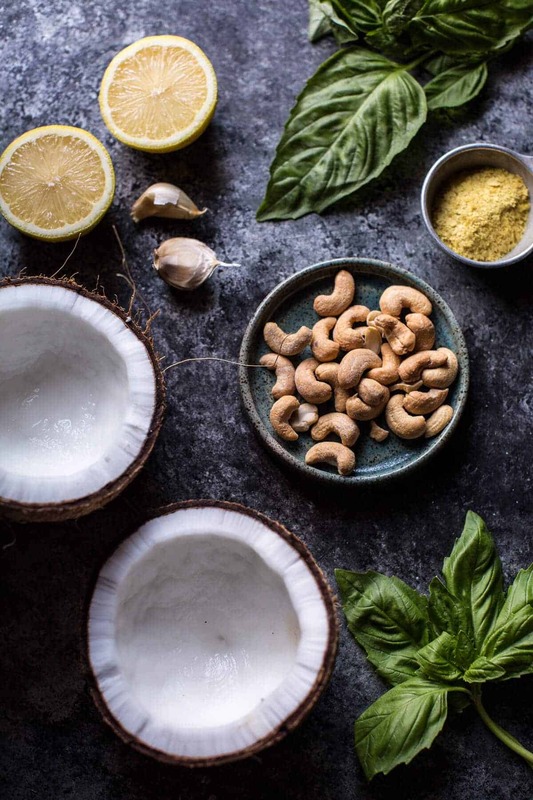 This recipe looks amazing- but I don’t have any cashews on hand– would it be too weird to use brazil nuts or hemp seeds or PINE nuts? Or is cashew really the only popular alternative nut used for that ‘cheesy’ taste? Started making the sauce and I”m wondering how to make it thicker? Hey amy, You can thicken the sauce on the stove if you’d prefer or add more nutritional yeast. For the nutritional yeast, do you use flaked or powdered? Powdered would use only half the amount of flaked and wondering which one you used? Hey Leslie! I use flaked. Let me know if you have questions. Thanks! What could you substitute for the coconut milk? Would greek yogurt work? I am so happy to hear that Catherine! Thank you so much! 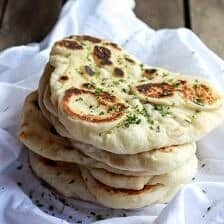 Hands down one of your best vegan recipes! The sauce, phenomenal. This recipe comes together quick and easy. Bought the vegan parm, (yum! )couldn’t even tell the difference from regular. Omitted the egg this time but once we add dairy back into our diet, the egg is going on! Excellent recipe! Was looking for a good recipe to cook spaghetti squash for the first time. This was great! The poach egg really makes this a win.